Timber Block Engineered Homes is the only Santa certified cabin he trusts to keep his elves and the children of Toronto warm this Christmas season. 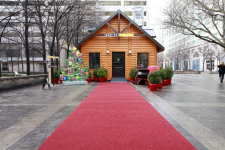 Santa will settle into his new Timber Block Insulated Log Cabin at the Toronto Eaton Centre starting November 28, 2014. Parents are invited to bring their children to visit him during the holiday season. Santa says ensuring the warmth and spirit of Christmas for all the little boys and girls was a top priority for him. "I spend all day in my beautiful, custom Timber Block log cabin and welcome many children to enjoy a short visit. Mrs. Claus and I chose Timber Block because the cabin had to be not only very energy efficient, but have all the charm, comfort and warmth that Christmas season entails. Plus it just reminds us so much of home." The fast build time also appealed to Santa. "During the Christmas season, it's go, go, go for me!" says Santa. "Timber Block's design team helped create a floor plan that worked for myself, Mrs. Claus, my elves, and there's even a special craft area for the children. Then, in just weeks, they delivered the walls, and within hours, the walls of my log cabin home were installed." Timber Block's patented system building process impressed Santa's personal helper. "Mrs. Claus was so happy with the beautiful cabin with large windows allowing for an abundance of natural light, she told me she would like to build a summer home," says Santa. "Many people may not know this, but Mrs. Claus is quite the modern lady! When searching through the dozens of Timber Block's plans, she came across the Contemporary Series. She fell in love with the modern architectural lines, an open concept design, and an outdoor living space to enjoy the summer sun." 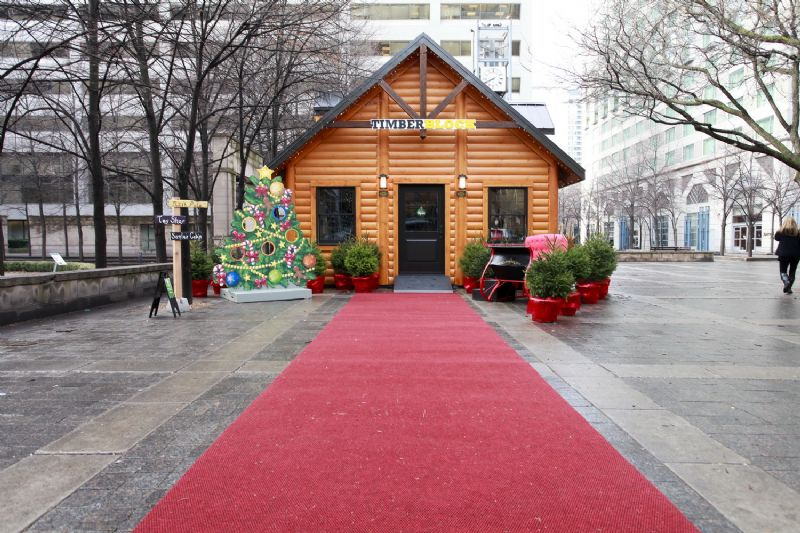 Parents and children can visit Santa in his Timber Block cabin during the holidays. Reservations are available, along with drop-in days. For more information, go to www.torontoeatoncentre.com. Parents can also visit two completed model homes in Innisfil, located an hour north of Toronto, on Highway 400, on the way to Cottage Country. More than 35 years of construction history, tradition and integrity is engrained in the team at Timber Block. Timber Block's parent company was established as a family business in 1977. Success thrived on customer satisfaction, and today, customer satisfaction remains our number one goal. In 1999, Timber Block realized the potential for improving both the insulation value and reduction in construction time within the log home market, and began working to perfect a proprietary idea to realize these improvements. Timber Block's patented system delivers a more ecological and environmentally sustainable product, combined with an insulation value of R-30 to R-36. To view the photo associated with this press release, please visit the following link: http://www.marketwire.com/library/20141125-TB800.png.